France is a prominent country in Europe as well as in the world. It’s part of Western Europe, and it is perfectly located, as it is adjacent to major countries like Germany, Italy, Spain and – although separated by a channel – the United Kingdom. There are some French-administered territories and departments outside of the European continent. These include islands like Guadeloupe, Martinique and the South American overseas region and department French Guiana. Every year there are several ecommerce events being organized in France. We have a handy ecommerce events calendar, where you can find all the major online retail events in Europe. But you can also check out only the ecommerce events in France. When ordering goods online, online consumers in France like to pay with credit cards. One popular way to do this is with Carte-Blue, a debit card that can also be used as a credit card. Two other popular online payment methods in France are Visa and PayPal. As regards the latter, there are more than 8 million PayPal account in France, which make it the third European country in terms of the number of PayPal accounts. The average French online consumer isn’t that keen on using alternative payments, but among those methods are Allopass, CM-CIC Paiement, Hipay, Moneo, Paysafecard and bank transfers. More tips for ecommerce in Germany can be found at EcommerceWiki. 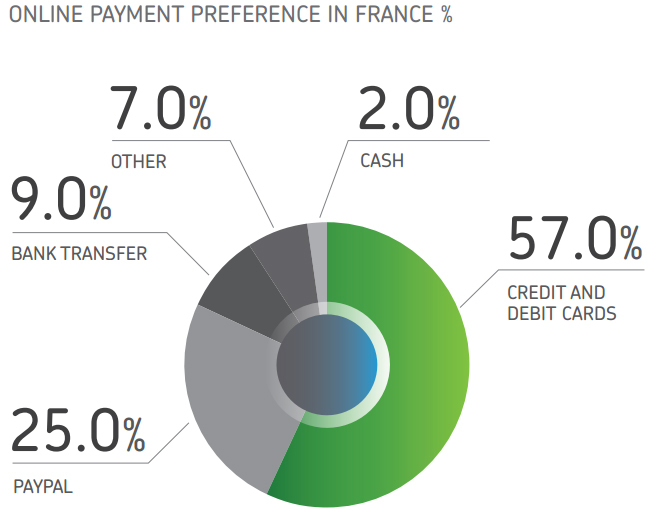 Online payment methods in France, according to Payvision. A study from CA Com shows that 49 percent of French consumers purchased at least one product online in 2013. Consumers ages 25-34 are the one who are most frequently ordering products online. On average they made at least one online purchase every month. Almost half of French internet users shopped for clothing online in 2012. Travel and tourism is even more popular, as 59% of French online users have bought a trip or a travel ticket online. Other popular product categories in Frenche are (digital) media and consumer electronics. A 2015 study by Mediametrie [pdf] shows nothing has changed drastically since then. Fashion was bought by 44% of French internet users in the last six months of that year. This is followed by travel/tourism (38%), cultural products (35%), beauty/health (28%) and consumer electronics (28%). France is one of the biggest ecommerce countries in the world. It’s ranked as the sixth biggest ecommerce market worldwide and in Europe only Germany and the United Kingdom are bigger. The Western European country has an online retail market that’s expected to reach 93 billion euros by the end of 2018. According to data from the Centre for Retail Search online sales in France account for 6% of total retail sales. Expectations are that there are more than 120,000 active ecommerce sites in France. The most visited online store in this country is Amazon, with more than 15 million unique visitors per month. Other big online players are Cdiscount, eBay, Fnac and Priceminister. Whereas fashion is a popular product category, retailers La Redoute and 3 Suisses are amongst the biggest fashion players in French ecommerce. Based on information from Médiamétrie/NetRatings, the top 5 of most visited ecommerce websites in France consists of Amazon, Cdiscount, Fnac, eBay and Voyage SNCF. April 4, 2019ManoMano, an online do-it-yourself marketplace from France, has raised 110 million euros in a funding round from Eurazeo, Aglaé Venture, and Bpifrance, as well as existing investors CM-CIC, Partech, Piton, and General Atlantic. March 19, 2019French supermarket Monoprix, a subsidiary of Casino Group, wants to further expand its partnership with Amazon. The two companies started working together last year, with Amazon delivering groceries in France through its Amazon Prime Now program. March 7, 2019The French Finance Minister Bruno Le Maire wants a 3 percent tax on the French revenue of large internet companies, such as Amazon, Airbnb, Booking.com and Criteo. It looks like an EU-wide digital tax plan will be ditched next week. Read all our articles about ecommerce in France.